Dunchurch residents are expressing concern over a proposal to build a ‘massive’ logistics centre on land to the south west of Rugby. DB Symmetry is preparing a planning application to build the centre, to be named Symmetry Park Rugby, on land near the M45/A45 roundabout. 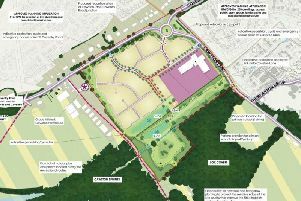 The proposed site has been controversially allocated for development as a new neighbourhood of up to 5,000 homes as well as employment development in Rugby Borough Council’s Submission Local Plan. Ann Wright, a member of the campaign group Save Dunchurch said: “It’s just so massive. She said there are also concerns over access to the proposed centre, as to whether the centre would provide appropriate employment which corresponds to the type of houses being built in the area, and the level of pollution the development could generate. A letter the group sent to Rugby Borough Council argued the proposal to build industrial units in the area is unjustified and unsustainable. Harry Sadleir, development director at DB Symmetry, said: “Our proposals are in response to the land allocation in Rugby Borough Council’s local plan which is due to be considered at an examination in public in November. The proposal is subject to a public exhibition, to take place at the Draycote Hotel, London Road, Thurlaston, on Thursday September 14 between 3pm and 8pm.